Sounds sourced from the real world and transformed into something either unreal or hyperreal serve as the foundation of a new compilation from the furthernoise.org netlabel. 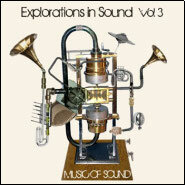 It is titled Explorations in Sound, Vol 3: Music of Sound and was curated by Roger Mills. Field recordings subjected here to digital modifications include rubber bands (yanked and flicked into numerous variations by Solange Kershaw, MP3), the electric hum of a lamppost (investigated for all its subtlety by Rebecca Mills), and the rush of traffic (modified to approach something melodic by Gail Priest, MP3). Those are just three of the album’s 11 tracks. Other participants include Thanos Chysakis, Robert Curgenven, Dithernoise, Iris Garrelfs & Douglas Benford, Derek Morton, Lea Piontek, John Kannenberg, and Phil Hargreaves. Get the full set as a Zip archive at furthernoise.org (ZIP).